Finding current information on the ARRL's Brass Pounders League (BPL) is difficult, and in fact a search on the ARRL.org website does not get you to a page with a date more recent than around 2012. I don't know whether the BPL has been 'obsoleted' or just does not enjoy the promotion level it once did. This article in The Dipole publication reviews a bit of the history of the Brass pounders League, and even mentions Mary A. Dougherty (a.k.a Mae Burke, W3CUL), who is featured in this 1953 QST article. She was born in 1911 and became a Silent Key in 1997. If I wasn't so busy, I would do some research to find out what the percentage of licensed female Hams was in 1953 compared with today. I wouldn't be surprised if the number was higher in 1953. A glance at the Brass Pounders League tabulation each month for the past nine issues of QST (January through September, 1953) has revealed some interesting facts. Each month at least three YLs have been listed, and in four of the months, five YLs have "made it." W2RUF and W3CUL placed high on the list for six of the nine months, and W2BTB made it seven times and topped everyone (OMs too) with the highest score in the last month analyzed, September. The survey period was arbitrarily chosen - the past nine months simply because of recent reference value. We all know that W3CUL has consistently placed high, often first, for a number of years (she has made BPL more than sixty times); and numerous other YLs have been listed at various times. Also, a number of YLs handle enough traffic each month to warrant places in BPL, but for one reason or another their calls do not appear. This is all realized, but it is not our purpose at this time to go into these aspects. In singling out the seven YLs who have made BPL more than three times in the past nine months, we have tried to uncover why these girls handle so much traffic and how they manage to do it consistently. Each has her own story. Mae Burke, W3CUL, an outstanding "traffic YL." W9JUJ, Peggy - "I like to handle traffic because of the thrill I get on delivering it. I could handle traffic all day and never get tired. Each message I handle I know will make someone happy. I don't find it hard to manage the house, OM, and two harmonics while handling traffic. The family seems to understand the enjoyment I get, and I try not to operate too much when they are around. And with a dishwasher, automatic washing machine and dryer, there isn't too much of a housework problem." W7ONM, Marion - "I like to handle so much traffic because you meet so many nice people and you feel you are really doing your own small part in helping out. It is something that just gets you and you can't leave it alone. I find it no harder to take care of house, husband and children. In fact, it is easier, because I find myself home all of the time." W8ZGT, Lillian - "I get satisfaction out of seeing how quickly I can get a message from here to there. Ham radio is one of the few hobbies that can be useful to others, and I feel that by sending messages for other people I am having fun and being useful at the same time. 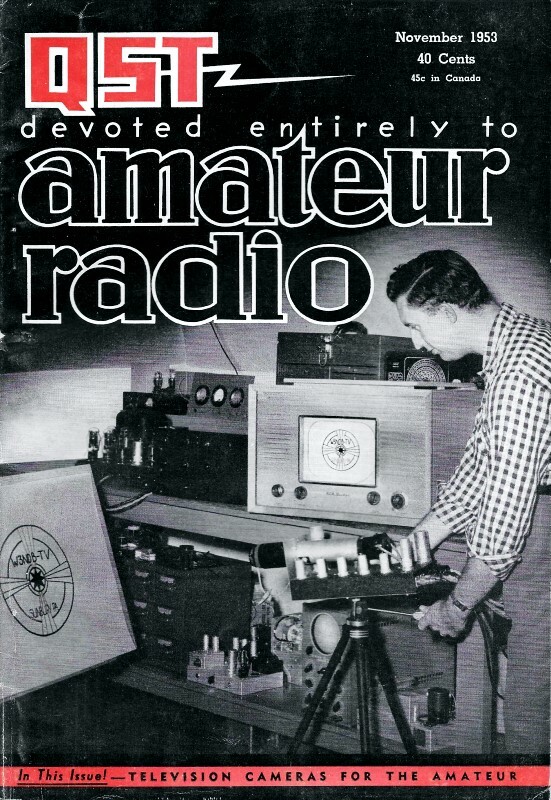 And my belief is firm that handling traffic well can do a great deal for amateur radio." W2RUF, Clara - W2RUF feels that she "is being of value to the community. Appreciation is so profound that it more than pays for my time and trouble. I never neglect my home. My OM (unlicensed) is very happy with my hobby because he enjoys his home and is satisfied that I am there with him most of the time." W4TAV, Marty - W4TAV considers the question "Why do you like to handle so much traffic?" comparable to asking a DX man why he chases DX. Traffic handling is simply the phase of amateur radio that she enjoys most. Marty is not married and consequently doesn't have to take care of a house and family. Just fifteen, and a high school sophomore, she takes books into the shack and studies "between nets, or in dull periods within a net." W3CUL, Mae - We didn't hear from Mae herself regarding "why" and "how" she does it, but her OM, W3VR, told us that handling traffic is vital to his wife. He said that she tries never to let down those who depend on her for relay and delivery, and that so long as she can handle service traffic she'll continue to devote most of her time to the work. Mae's staggering record speaks for itself. W2BTB, Jeanne - "If you could see some of the many letters in my bulging file, if you could hear the parents of service men on the telephone calling from local and long distances, so grateful, you would understand my handling so much traffic. My real purpose is just to help the GI and his family - maybe it's because I have a son of my own. Knowing the operators and bases, knowing they depend on me for an outlet, I do not, if I am able, want to let them down." And anyone who is acquainted with Jeanne knows how much she accomplishes in her home and community. She does manage and very capably, too. Hats off to a remarkable group of girls! Three YL Century Certificates have been issued to date. The YLRL Chairman of the Fourth District is probably better known by her old call, W8TAY, than by her new one, W4JCR. 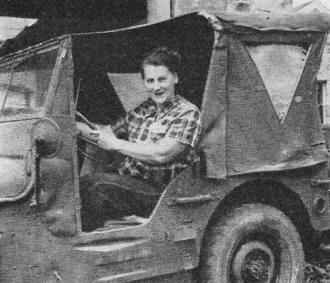 Anita was YLRL President and Harmonics Editor in 1942 and '43, was 4th D. C. in '47 and '48, and Publicity Chairman for six terms. She organized the first local YLRL chapter in Cleveland and initiated QRV as the Club's motto. Currently, in addition to D.C. duties, she is chairman of the committee appointed to revise the YLRL constitution. Nita and her OM W4JCS now reside in Asheville, N. C., where she is employed as a writer for radio and TV. 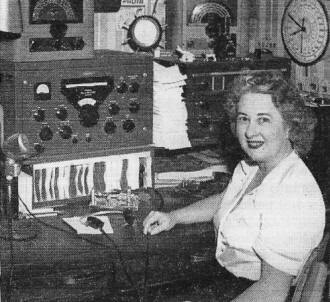 other commitments, W8HWX and W8HUX, Lillian and Marvel, will soon have to forego their Ham Shack Gossip monthly news bulletins which they have edited for the past four years ... W7QYX, Doris, maintains daily skeds with her OM, W7QYZ, who operates a commercial salmon trawler in Alaska. ... W6YRL and W6UHA appeared as guests on one of W6NAZ's (Lenore) recent TV shows. Sandy and Maxine talked about traffic handling and DXing respectively. 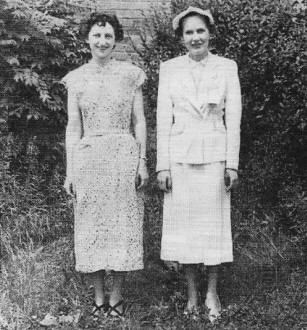 W6NZP, Evelyn, and W6LMQ, Eleanor, were guests another day and discussed their part in the 1953 All Women's Transcontinental Air Race. Audience response was enthusiastic, and Lenore urges YLs throughout the country to appear on radio and TV programs in behalf of amateur radio ... The YLs who attended the South Hills Brass Pounders and Modulators Hamfest at South Park, Penna., were W3s QPJ QPQ TTR TYC UTR UUG and W9MLE ... And W1s OAK UET UNF VZD WJA YYU and W2MLT had fun at the Vermont c.w./'phone picnic on Sept. 23rd ... W1FTJ, Dot, is proudly displaying her new OT certificate ... W4UDQ, "DB" and W1VYH, Betty, are happy about receiving their General Class licenses ... YLRL Third District Chairman, W3SVY, is sorry to report that W3QPJ has been quite ill again. Loreli says that notes and cards for Kay would be appreciated ... Twenty-five YLs were present at the season's first meeting of the Los Angeles YLRC. Special guests were W3VNN, Shirley, and W5RFK, Delores. The membership was pleased with the new club pin (blue lettering on silver ovals, suspended on blue ribbons). W6WRT, Ruby, and W6FKH, Ben, were the first YL and OM to win the club's Lad 'N Lassie Certificate ... We believe newly-licensed Sharon Pakinas of Bothell, Washington, still takes honors for being the youngest YL licensed. Sharon, you know, was just seven years old. 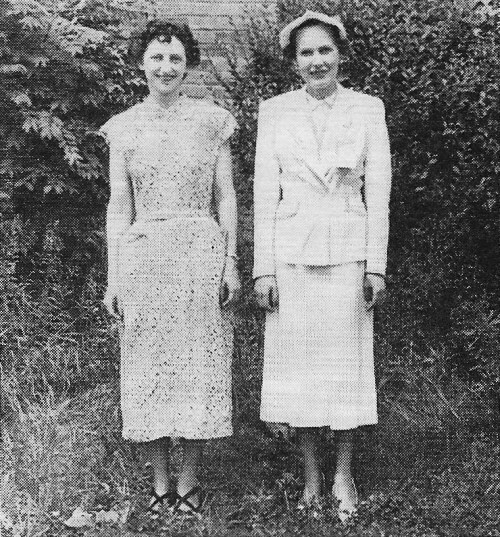 If Eleanor Wilson had letters after her name, we would know whether to use Miss or Mrs. when writing to her. Set aside Dec. 5th ('phone section) and Dec. 12th (c.w. section) for participation in the YLRL 14th Anniversary Party! The contest is open to all YLs, whether or not they are members of YLRL. Full details next issue.